Browse: Home » 2010 » March » How does this make you feel? We are by nature social animals. This is one of the reasons social networking is so huge and has had exponential success. We like to know that others are thinking about us, wondering about us, concerned about our feelings. We also like to tell others these facts, we like to share. Because of this many people like to give feedback, and providing an outlet for that can be a huge resource of wealth for any website. Knowing what your customers do and don’t like, and how they feel about your products. On top of that, when you make this information public it has a persuasive social influence factor that can affect others who read those reviews and their opinions of your service or product. This is why amazon uses reviews, they know if 5 people say thing 1 is good, and 5 people say thing 2 is bad, even without knowing those people you will buy thing 1 over thing 2. I was pleasantly surprised to see all these factors at play the other day when checking out the Foodspotting website regarding their new app. I was disappointed to see that it wasn’t available for Android phone users and looked for a way to request this. This is when I found the “Feedback” link. This link is provided as a service to the site through GetSatisfaction.com. 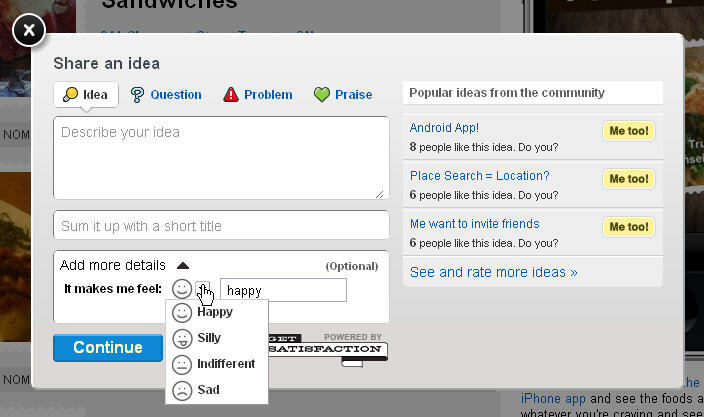 It opens a feedback panel that I found designed particularly well. Not only could I read other ideas from the community (including seeing the idea I was about to post), but I also had options. I could chose how I gave feedback, whether it was to share an idea, a question, a problem or simply praise for the site. My favorite part however was under the “Add more details” drop down when they asked how does this make me feel. It sounds so simple, but it is so powerful at the same time. It says not only that your feedback is valuable, but that the company is genuinely concerned with your feelings. It says “We care about what you think, and you are important to us”. And who doesn’t want to feel important? It plays to our core of wanting to be recognized, appreciated and heard. In return for their genuine concern, we then feel better about, and more inclined to, return the favor by using their product or service over a competitor who we don’t feel cares quite as personally about our feelings. I had a similarly positive experience with Balsamiq. I think they were also using this same feedback engine, actually. One thing that I found particularly notable about going through it with them was that the lead creator was very active in the discussion and actually listened and dis his best to make things right. As I browsed through all of the feedback, i really got the sense that he was actually trying to address his customer’s concerns, rather than explaining them away. This, for me, took it to the next level. Interesting article when you begin thinking about the introduction of social networking in the work place and as it relates to feedback between employees (since we often are in roles as customers and those providing services to each other) . I think people are often hesitant to provide meaningful feedback about deliverables, responsibilities and other interactions with co-workers because it is, basically difficult to give and receive feedback. How about providing a safe space for employees to give and receive feedback about their work so they can address issues before they are to difficult to manage?